As another year of our RVing journey rolled to a stop, we drove our motorhome some 7500 miles which is the second shortest out of the four plus years we’ve been full timing. This is in part to client obligations that kept us primarily in the central part of the country. That said, we added 20 RV parks that we had never visited before in 9 different states. Along the way we met lots of new friends and were able to reconnect with many we had met previously. *Benson, AZ – Tucson, AZ – Anthony, TX – Ft Stockton, TX – Lakehills, TX – Bridgeport, TX – *Wiley, TX – *Joplin, MO – Liberty, MO – *Tama, IA – *Monticello, IA – Omro, WI – *Peoria, IL – Omro, WI – Tama, IA – Lincoln, NE – *Onawa, IA – *Gretna, NE – Tama, IA – Omro, WI – Tama, IA – Gretna, NE – *Ogallala, NE – *Englewood, CO – *Canon City, CO – *Antonito, CO – *Fountain, CO – *Colorado Springs, CO – Englewood, CO – *Santa Fe, NM – *Albuquerque, NM – *Winslow, AZ – Cottonwood, AZ – *Congress, AZ – *Apache Junction, AZ – Mesa, AZ – Congress, AZ – *Casa Grande, AZ. Looking at the list of stays, you’ll notice a couple that repeat. One being Omro, WI, which is where we primarily stay while visiting our family. The other is Tama, IA. 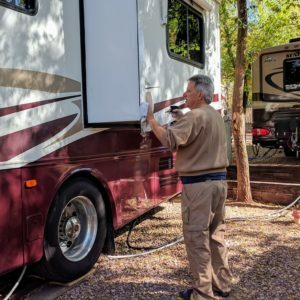 As full time RVers we are always looking for places along our most frequently traveled corridors to stay that are frugal in cost yet provide us with a nice, safe place to rest overnight. The Meskwaki Bingo Casino and RV Park is such a place, 50 amp electric, long level concrete parking pad and access to a dump station and water refill. 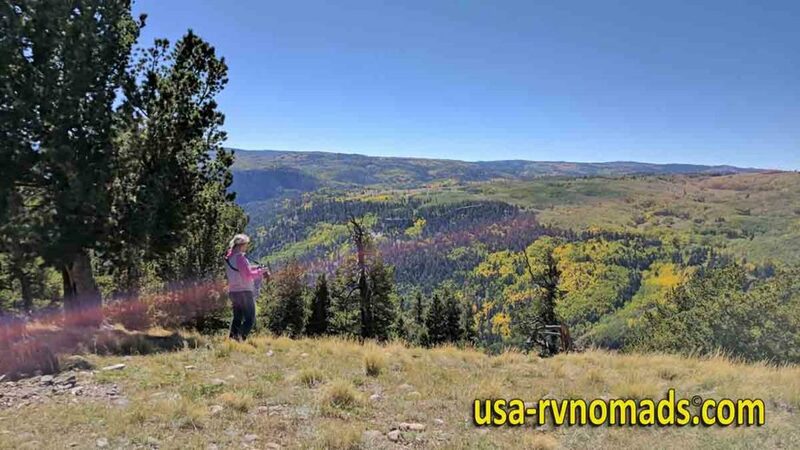 Two of our favorite places this year were Twin Rivers Cabins & RV Park in Antonito, CO and North Ranch SKP in Congress, AZ. Our least favorite stop, but one that was required for business purposes was Englewood, CO which is in the heart of Denver. While many RVers don’t like KOA‘s due to their cost per night and they’re often geared to families traveling with small children, we stayed at seven KOA parks this year…Anthony, TX – Joplin, MO – Onawa, IA – Gretna, NE – Canon City, CO – Fountain, CO and Santa Fe, NM. We use our KOA membership points to offset the cost of the more expensive destination KOA resorts. KOA Journey’s are usually conveniently located along major highways and Interstates, have suitable length pull thru sites and decent laundry facilities…and those that offer it…their pizza isn’t bad either. Get in, setup, catch up on laundry, eat and out early the next morning. Our only major challenge this year mechanically with the coach was with our refrigerator, a recurring problem that started last summer in South Carolina. The heat and humidity in Nebraska and Iowa played havoc with our fridge again this year. High temps and humidity really put a strain on its cooling system. Come to think of it, we also had to replace our water pump when it died this year. It felt good when we found RV parks that allowed the washing of our coach. Unfortunately, they were few and far between for most of our travels this year. We ended this year by taking advantage of a park whose policies allowed washing and the weather cooperated as well so I could give it a thorough cleaning and waxing. I finished up the last day of 2017, by hand waxing the roof (ours is aluminum) so it is ready for whatever nature throws at it during the winter months here in the southwest. 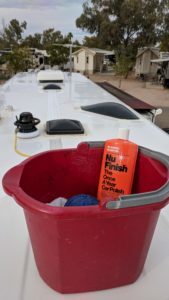 My new years resolution as it pertains to the maintenance and upkeep of our coach…stay ahead of the preventative maintenance and do as much of the other care more frequently to make it easier such as removing of the bug splatter on the front end after each travel day.